Feature your brand at our community events! Low-Line Market, Lakeview Live, Trick or Treat on Southport and Lincoln Ave Beer Stroll provide fun opportunities for residents of Lakeview and the surrounding communities to get together, enjoy the outdoors, and explore the neighborhood. By sponsoring a community event your company will set yourself apart from your competition by demonstrating positive corporate citizenship and distinguish your products or services from others by conducting surveys or on-site sampling. You will attain great visibility within the community and build strong relationships with existing and potential customers, and align your business with our sound vision of bringing the community together and improving local economy for a better quality of life. Click here to download the sponsorship brochure for more information on our events and contact Carisa Marconet at Carisa@LakeviewChamber.com or 773.472.7171 ext 105 to get more information about our various opportunities for your brand to make an impact on Lakeview and the surrounding communities. We offer advertising opportunities in our bi-weekly “Happening in Lakeview” community newsletter. For additional information and to place an ad, email info@lakeviewchamber.com. ​Sign up here to receive our Happening in Lakeview eNewsletter. Gain further exposure for your business by sponsoring a street pole banner! The program is a great way to increase your brand's visibility while also helping us brand our community. Banners give your business 24-hour visibility on some of Lakeview's busiest streets including Addison, Ashland, Belmont, Lincoln, and Southport. 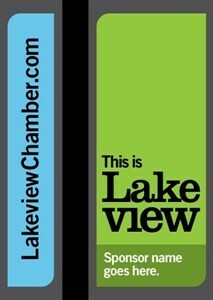 Click here to download the Lakeview Street Pole Banner Contract! The Chamber will secure all necessary permits and offers proofing, installation, and maintenance at no charge to you. In addition, we will handle the reinstallation of any damaged banners at no additional cost to you. The Lakeview Chamber is pleased to continue our partnership with the Daily Herald/Town Square Publications to produce our annual Lakeview Neighborhood Guide. The guide will be published in early 2019 and will provide an exciting opportunity for you to promote your business and expand your reach! The Lakeview Neighborhood Guide will be delivered to over 10,000 single-family homes in West Lakeview with additional distribution by the Chamber throughout the year, for a total of 14,000 copies in circulation. The guide will be printed in a convenient 4" x 9" format and will also be available electronically on the Lakeview Chamber’s web site (click here to view the 2018 guide). For information about advertising opportunities, download the 2019 Lakeview Neighborhood Guide media kit here.